I am starting a new series! The monthly DIY Umrah options. I keep getting these emails with the crazy prices so I though I will put a short guide with hotels, flights and basically your own DIY Umrah for every month. The prices I see are sometimes crazy even for low season, like £1500 per person, when in reality you can have and plan your own DIY Umrah package for like £800 per person. The package is for 10 days from 18th of May to the 27th of May with 5 nights in Makkah and 5 nights in Medinah. Flights usually cost £300- £500 for Umrah depending on the season and whether you want to go direct or have stopovers. Many airlines now allow you to have a free stopover like Qatar Airways, Emirates and Etihad. Qatar Airways even gives you a free visa for 92 hours in Doha so you save £20 per person. The flights in May even the first few days of Ramadan are £350 per person with Middle Eastern airline and stopover in Beirut. 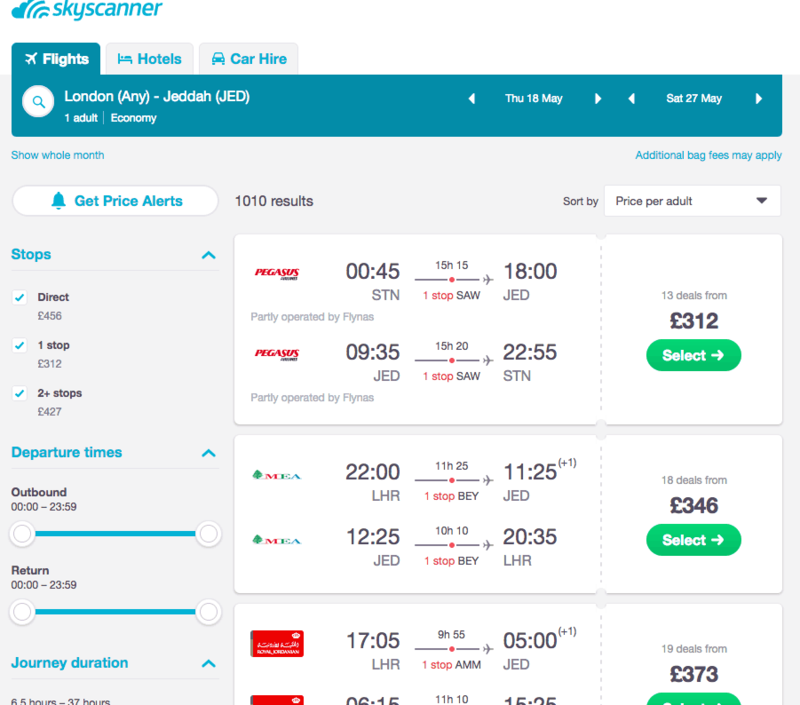 I personally always use SkyScanner as my number one point of search since I have found great deals and It is easy to use. 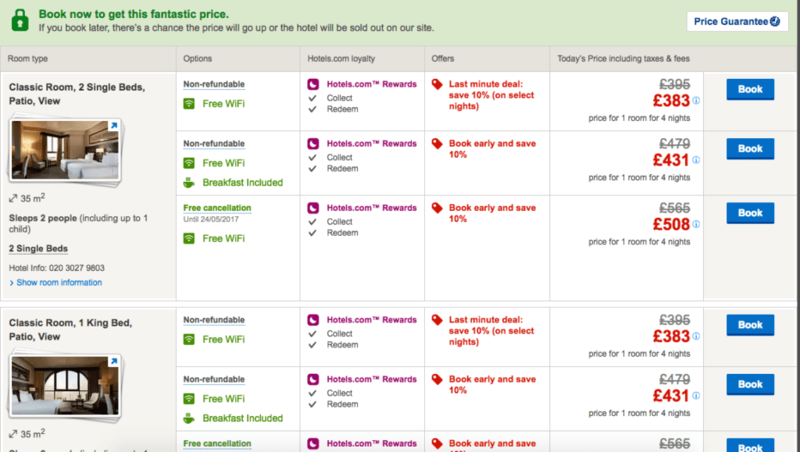 Hotels in Makkah are always more expensive than hotels in Medina but I find that the perfect time to go is actually just before Ramadan starts. If you plan your trip and your first stop in Medina you can pay low prices and still do Umrah with the Prophet (pbuh). A closer option to Haram will be the Conrad Hotel only steps away from the Haram, it is a brand new hotel with some raving reviews. I am definitely looking forward to staying there soon myself soon. With Hotels.com you also receive 1 reward night after every 10 nights, which if you are staying 10 nights you will get one reward night to use anywhere you want, even for your next holiday. 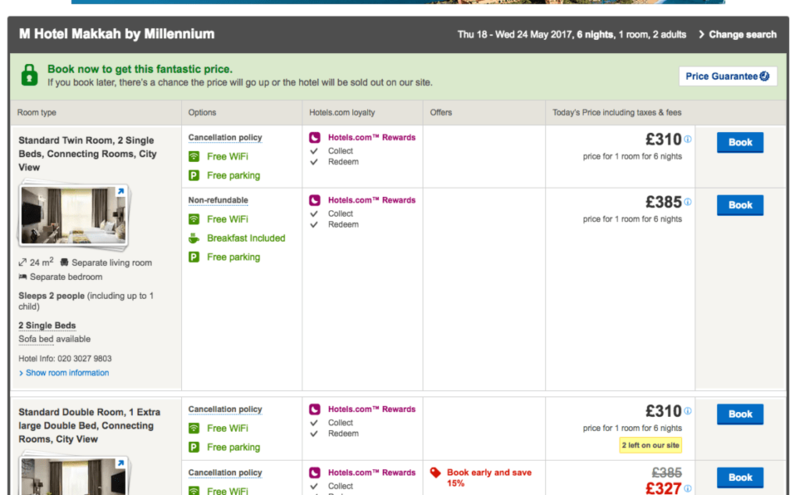 Medinah hotels are cheaper and if you read the previous post on the new hotels, the Pullman ZamZam is one of the contenders for this. It is new, great customer service, some of my readers stayed and loved it, always read the reviews too. Now, of course a big element of Umrah is the passport and the transportation. Usually these put off people creating their own Umrah packages but in reality it is very easy to get around. From Jeddah airport I use Uber as the easier option to get to Makkah without hassle. It is about £50 and you know what the meter says so you can plan better. For my trips between Makkah and Medina I recommend the VIP SAPTCO coach but make sure you go early to book your tickets because they do sell out. Time to put together the cost of Umrah for two people for 10 days and this includes the first few days of Ramadan 2017. However also note you will receive a reward night certificate if you book all your hotels via Hotels.com plus you can also get up to 15% discount via Topcashback on top. Step by Step Awesome Deals on Umrah, Book for Less than £700 per person next to the Kabah! Aslaaamalaykum. I used Princes’ visa services last month and they did not honour your discount. They said their prices were already discounted and very cheap. I was really angered to be honest. Not for not receiving the discount but I felt that they were taking advantage of your free marketing without honouring your agreement. In addition we agreed to everything to be handled by post in the price then when my visa arrived at their offices they said I had to collect it or pay £9.50 to have it posted. Thank you very much for letting me know, I have emailed them asking about this. It is really unacceptable if this has happened. Our agreement with them is that they will be actually providing the discount for you and I will promote them, so they are not keeping their end of the bargain. Jzk for letting me know because otherwise, it wouldn’t have come to my attention. I had a chat with Prince Visa who did show me the details and that you did receive the offer, the visa is £85 per person which is what I have been told and advertised. I believe the confusion happened when they offered the discount without telling you it was from MTG. With regards to postage I do actually pay for it as well 🙂 it is on top of the visa price. Yes I think that’s the confusion. I called them up and then asked them the price, without mentioning MTG. They said £85, then I asked them for the discount with MTG and they said its already discounted, which I thought was a little disingenuous. Sounds like its the price they give everyone. Assalaamu alykum hope you are well. Can you advise if I can get a visa for umrah from the uk if I have a british passport but reside in zambia? Great blog and very imformative. I am Insha’Allah going Umrah with my family this December and have booked flights and hotels myself rather than with an agent. We are travelling to Madinah first and then Makkah. Can I please ask if you ever had any trouble with immigration officials or ‘official looking’ gentlemen taking your passports at the airport for Umrah? I appreciate during Hajj it is the protocol but surely we should not leave the airport without having our passports back in our hands? I have heard stories where the taxi driver has to go and collect passenger passports. My question really is should I be making a scene if my passports aren’t handed back after immigration is complete?